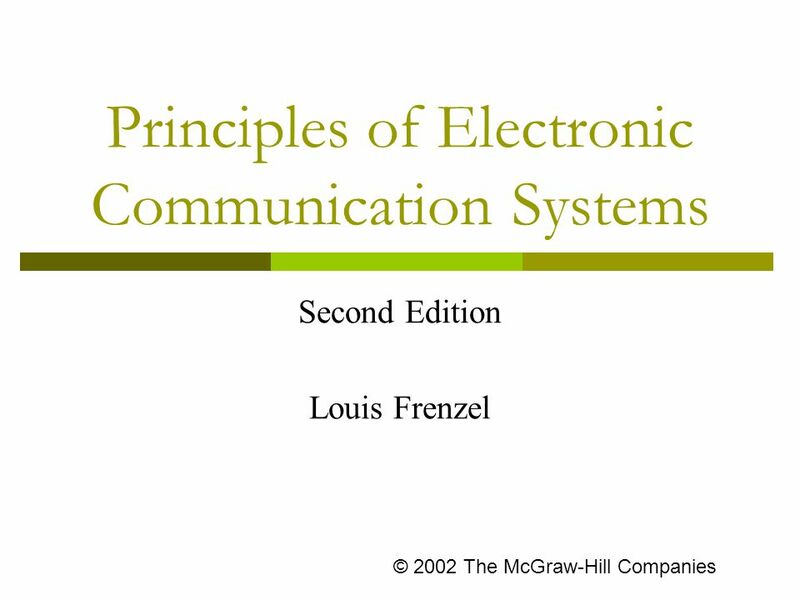 Principles of Electronic Communication Systems Second Edition Louis Frenzel © 2002 The McGraw-Hill Companies. 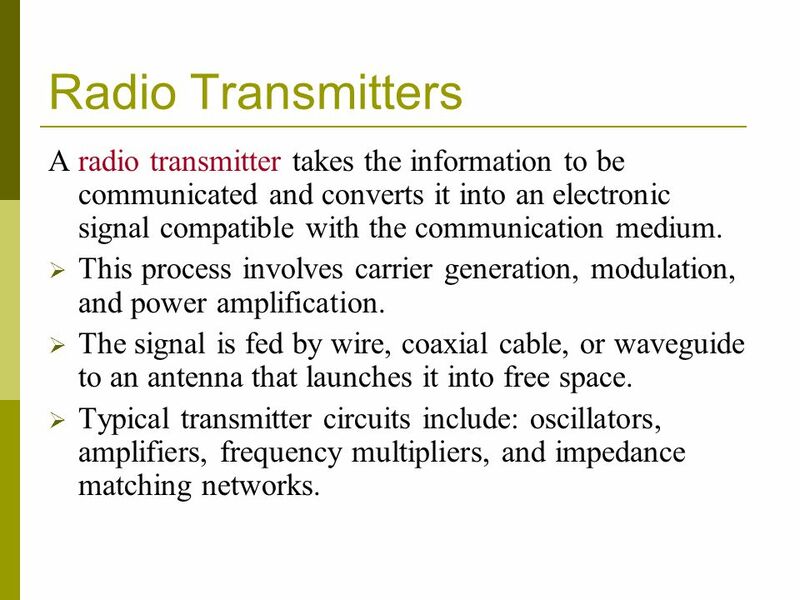 3 Radio Transmitters A radio transmitter takes the information to be communicated and converts it into an electronic signal compatible with the communication medium.  This process involves carrier generation, modulation, and power amplification.  The signal is fed by wire, coaxial cable, or waveguide to an antenna that launches it into free space. 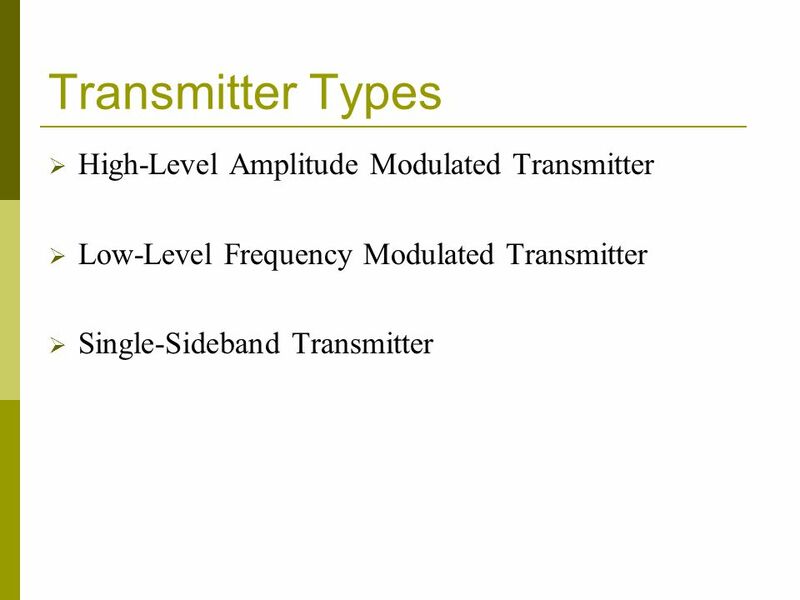  Typical transmitter circuits include: oscillators, amplifiers, frequency multipliers, and impedance matching networks. 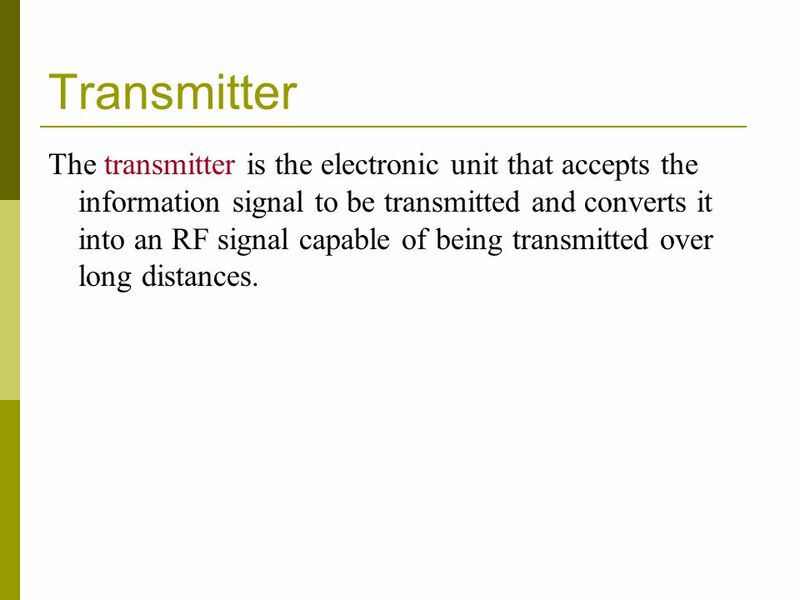 5 Transmitter The transmitter is the electronic unit that accepts the information signal to be transmitted and converts it into an RF signal capable of being transmitted over long distances. 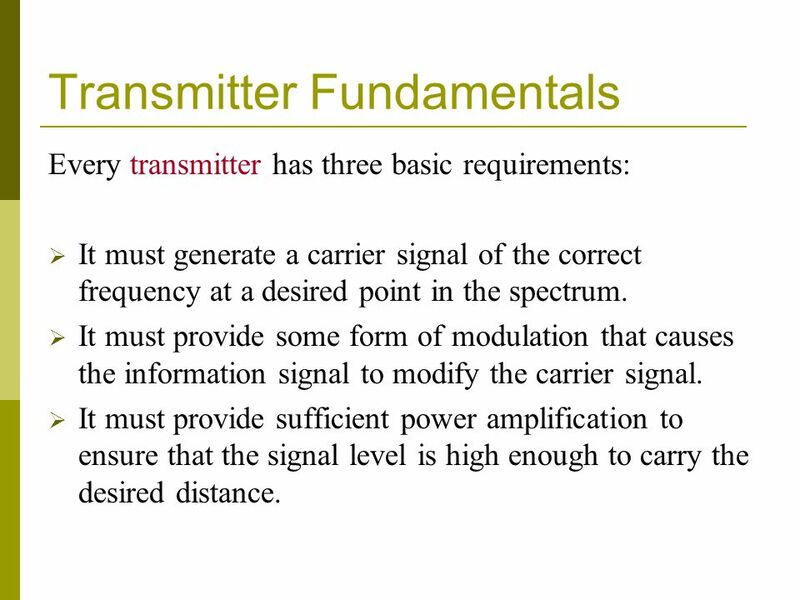 6 Transmitter Fundamentals Every transmitter has three basic requirements:  It must generate a carrier signal of the correct frequency at a desired point in the spectrum.  It must provide some form of modulation that causes the information signal to modify the carrier signal.  It must provide sufficient power amplification to ensure that the signal level is high enough to carry the desired distance. 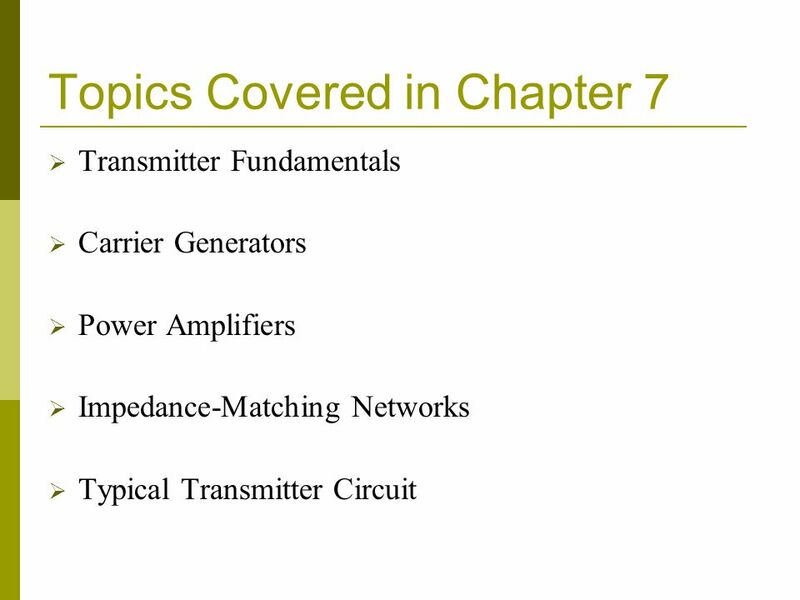 7 Transmitter Configurations A continuous wave (CW) transmission can be generated by a transistor oscillator.  The oscillator generates a carrier and can be switched off and on by a telegraph key to produce the dots and dashes of the International Morse code. 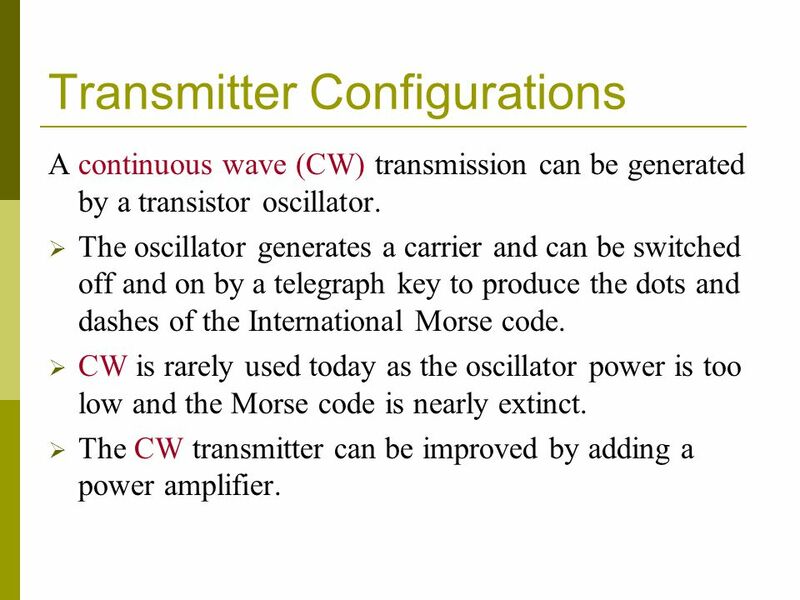  CW is rarely used today as the oscillator power is too low and the Morse code is nearly extinct. 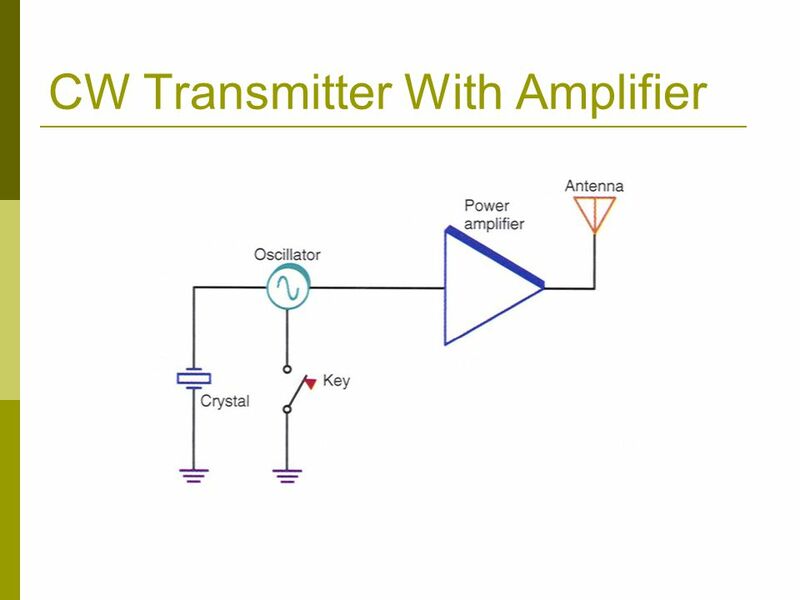  The CW transmitter can be improved by adding a power amplifier. 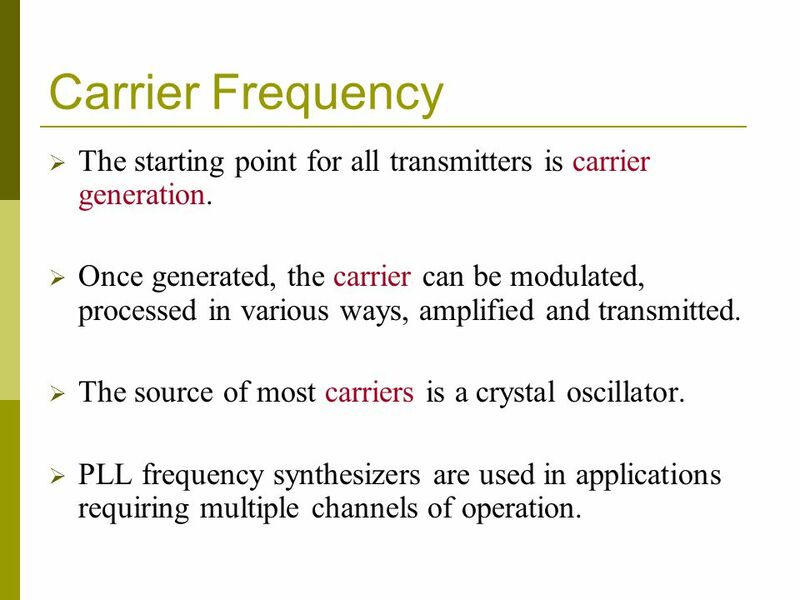 10 Carrier Frequency  The starting point for all transmitters is carrier generation. 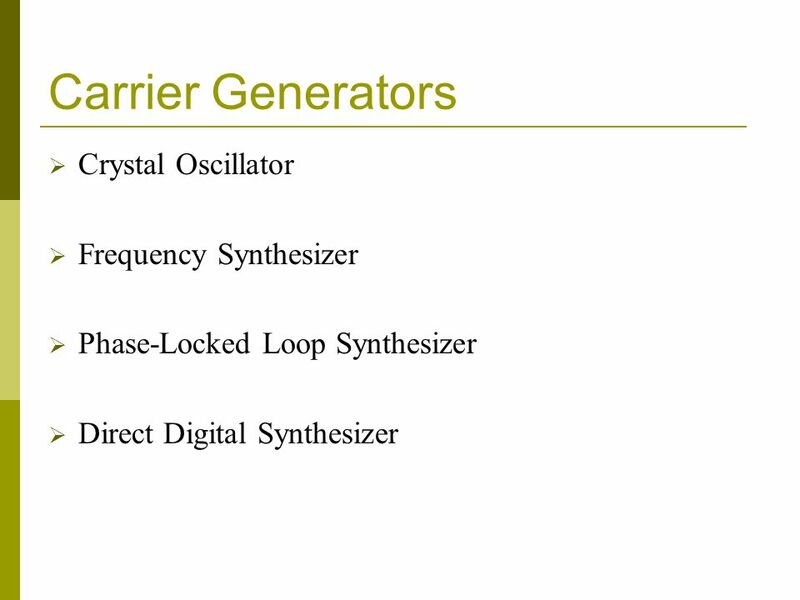  Once generated, the carrier can be modulated, processed in various ways, amplified and transmitted.  The source of most carriers is a crystal oscillator.  PLL frequency synthesizers are used in applications requiring multiple channels of operation. 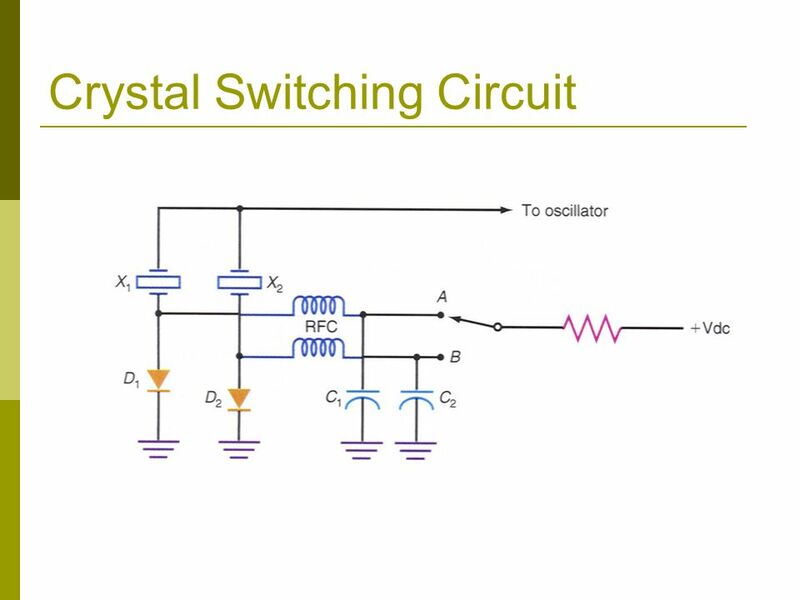 12 Crystal Oscillator  The only oscillator capable of maintaining the frequency precision and stability demanded by the FCC is a crystal oscillator.  A crystal is a piece of quartz that can be made to vibrate and act like an LC tuned circuit. 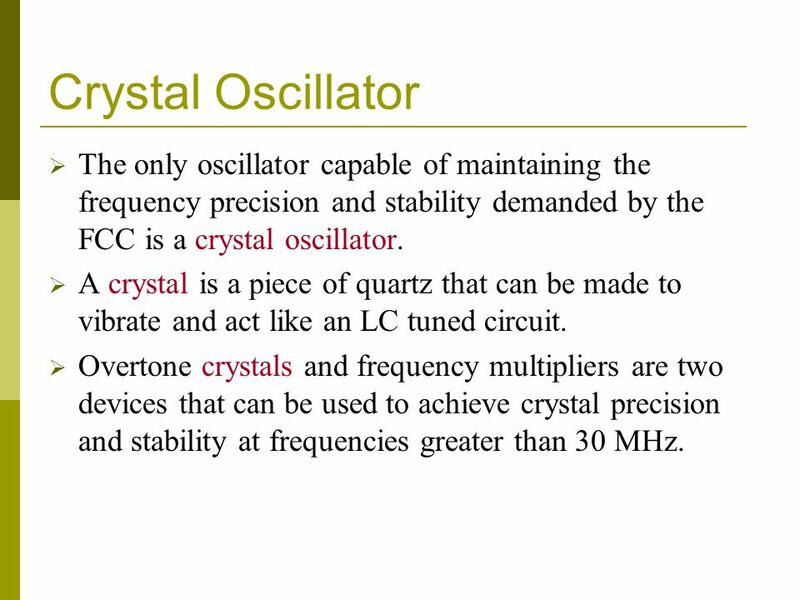  Overtone crystals and frequency multipliers are two devices that can be used to achieve crystal precision and stability at frequencies greater than 30 MHz. 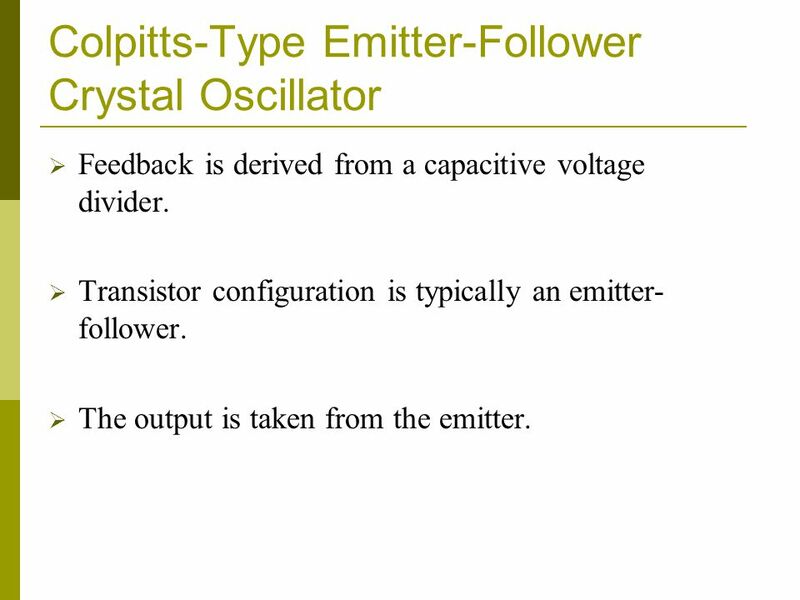 13 Colpitts-Type Emitter-Follower Crystal Oscillator  Feedback is derived from a capacitive voltage divider. 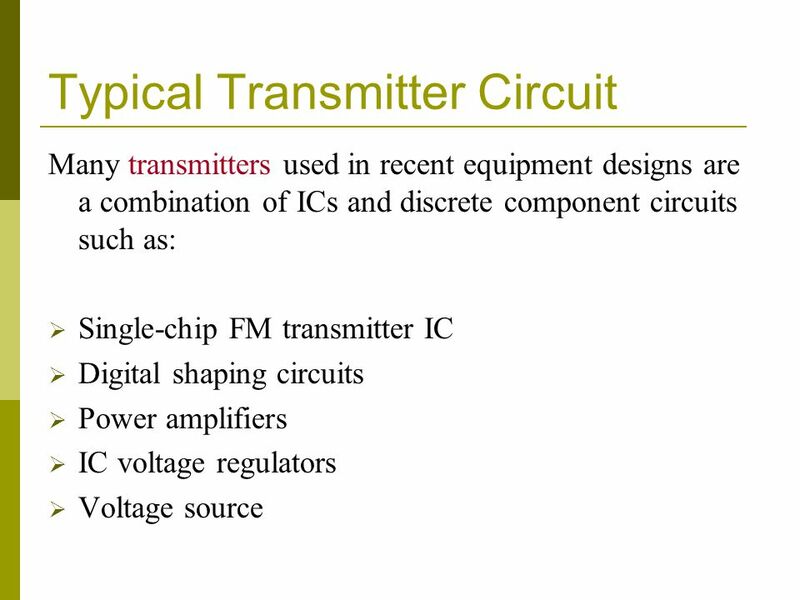  Transistor configuration is typically an emitter- follower.  The output is taken from the emitter. 15 By Definition…  Pulling, or rubbering capacitors are used to make fine adjustments to the crystal oscillator frequency. 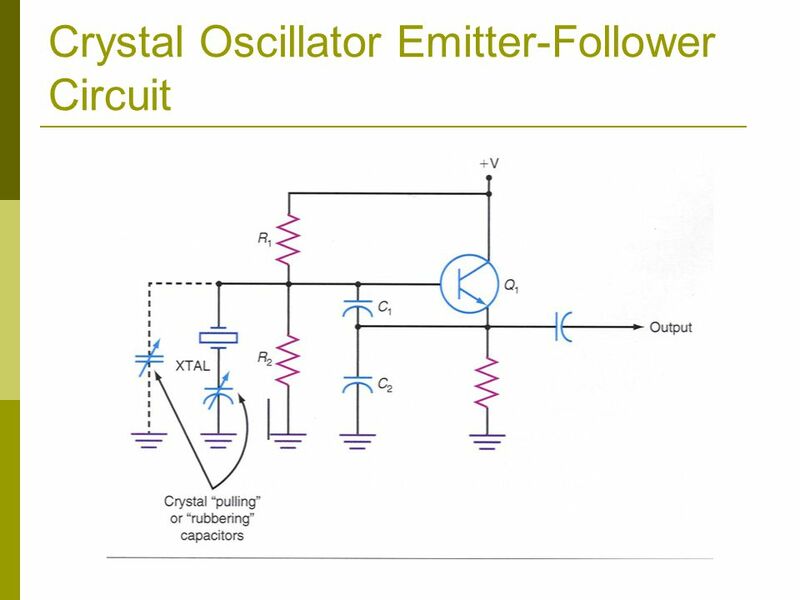  Field-effect transistors (FETs) make good crystal oscillators. A FET is used in the Pierce oscillator. 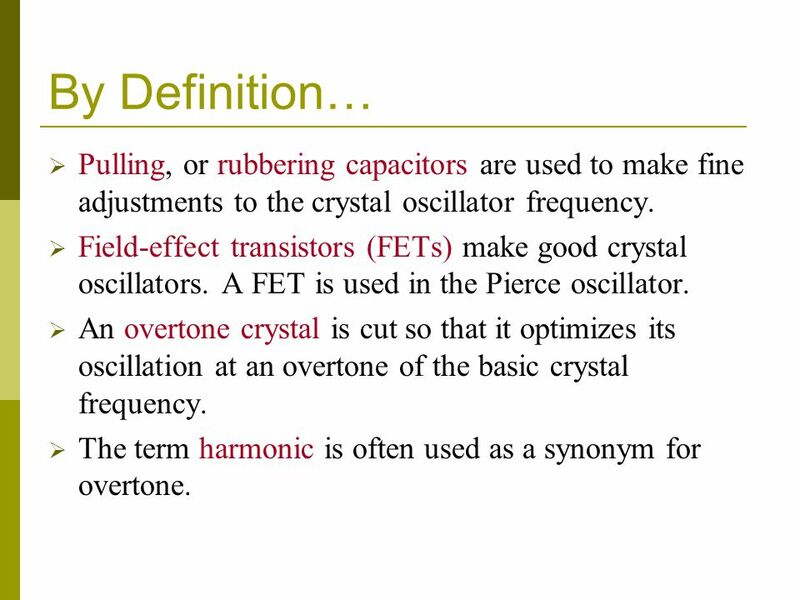  An overtone crystal is cut so that it optimizes its oscillation at an overtone of the basic crystal frequency.  The term harmonic is often used as a synonym for overtone. 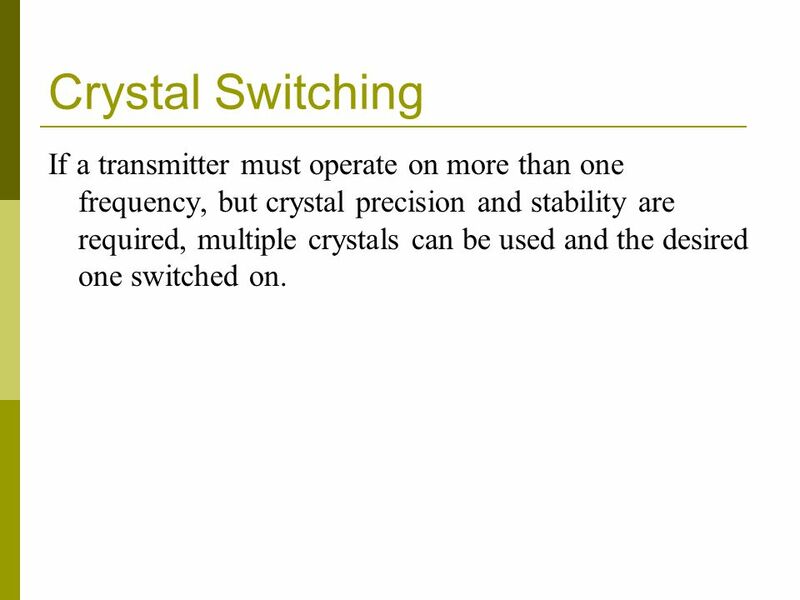 16 Crystal Switching If a transmitter must operate on more than one frequency, but crystal precision and stability are required, multiple crystals can be used and the desired one switched on. 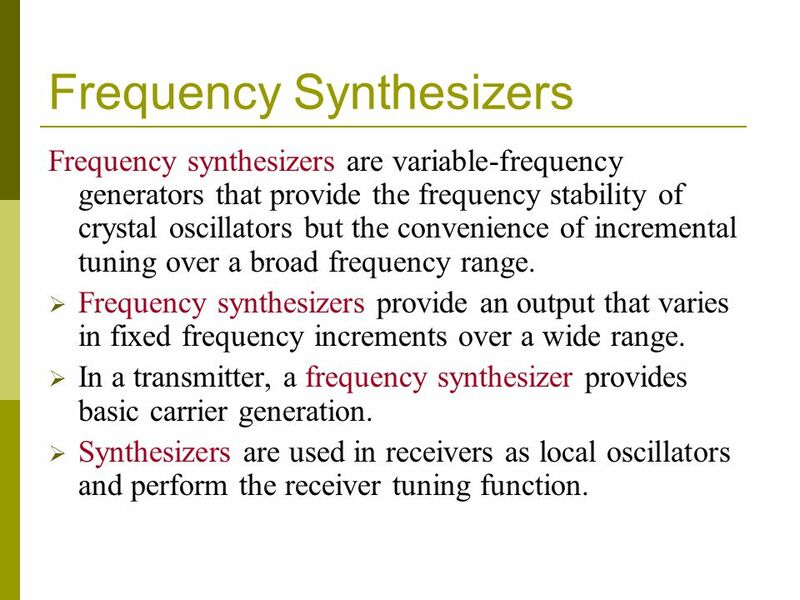 18 Frequency Synthesizers Frequency synthesizers are variable-frequency generators that provide the frequency stability of crystal oscillators but the convenience of incremental tuning over a broad frequency range.  Frequency synthesizers provide an output that varies in fixed frequency increments over a wide range. 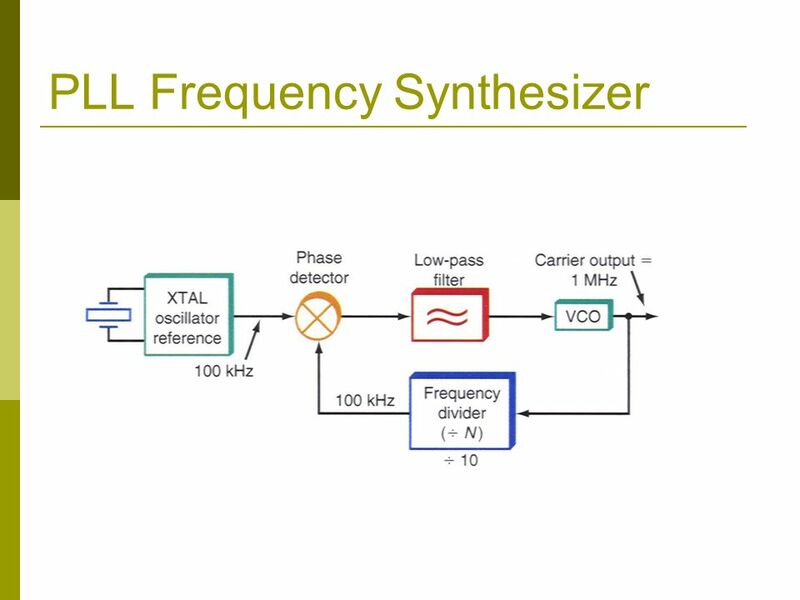  In a transmitter, a frequency synthesizer provides basic carrier generation.  Synthesizers are used in receivers as local oscillators and perform the receiver tuning function. 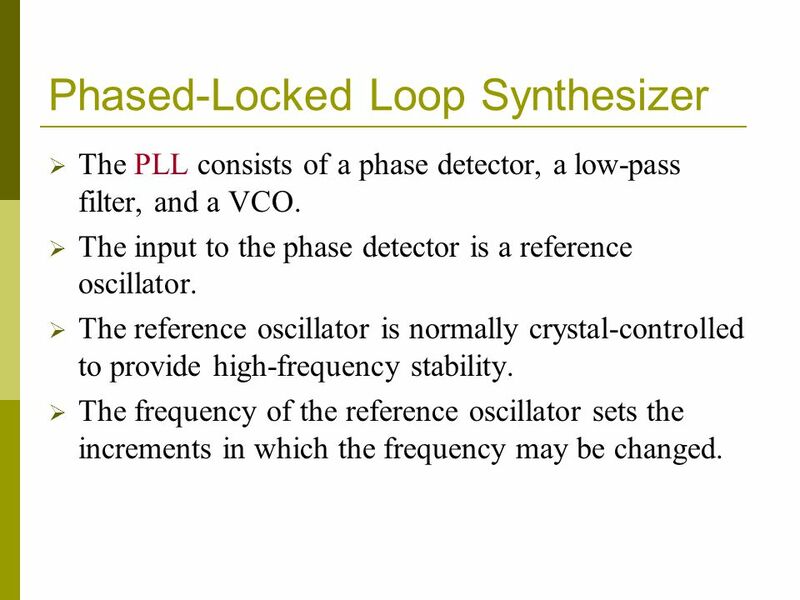 19 Phased-Locked Loop Synthesizer  The PLL consists of a phase detector, a low-pass filter, and a VCO.  The input to the phase detector is a reference oscillator.  The reference oscillator is normally crystal-controlled to provide high-frequency stability.  The frequency of the reference oscillator sets the increments in which the frequency may be changed. 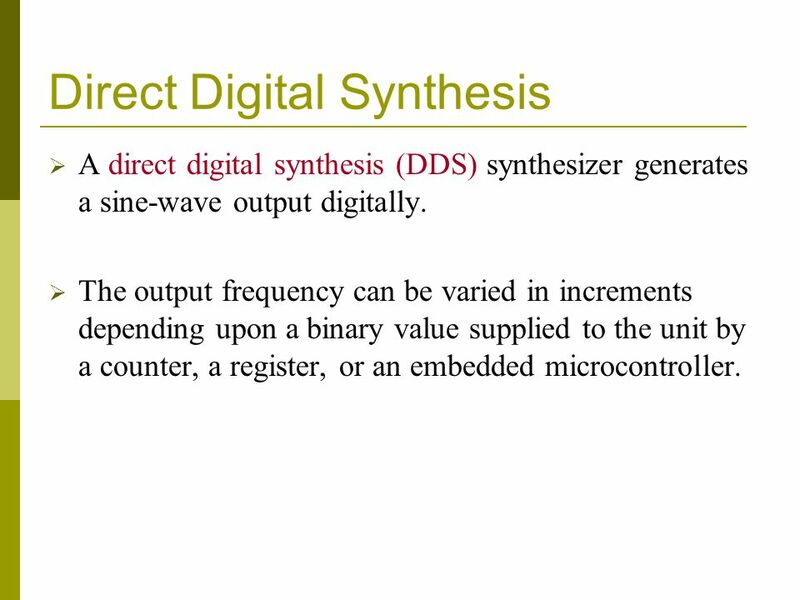 21 Direct Digital Synthesis  A direct digital synthesis (DDS) synthesizer generates a sine-wave output digitally.  The output frequency can be varied in increments depending upon a binary value supplied to the unit by a counter, a register, or an embedded microcontroller. 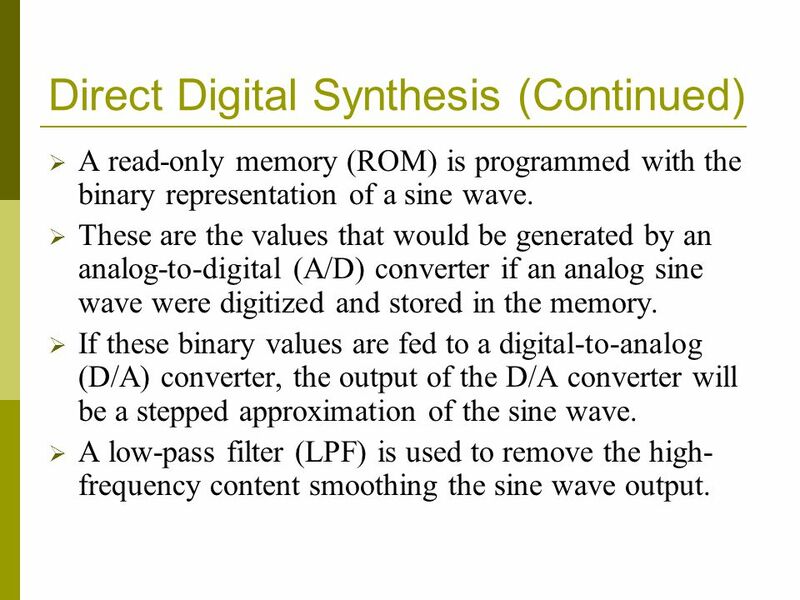 22 Direct Digital Synthesis (Continued)  A read-only memory (ROM) is programmed with the binary representation of a sine wave. 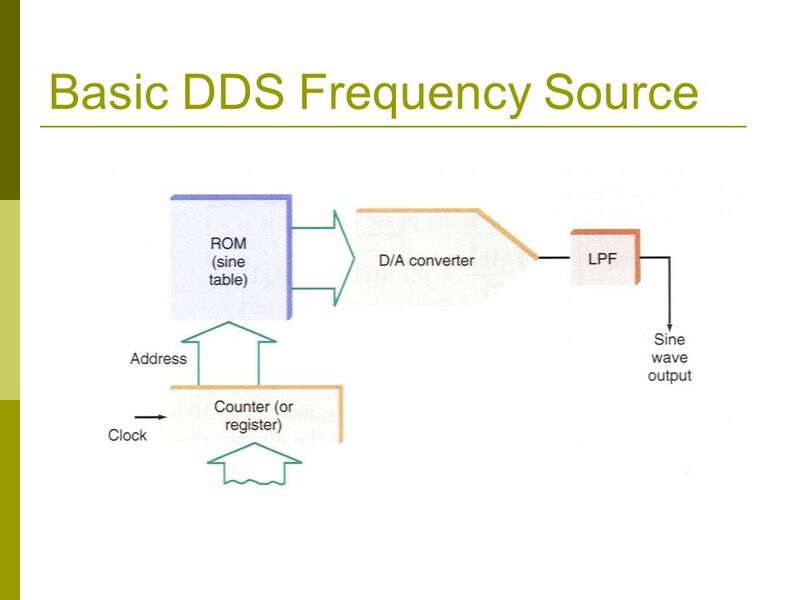  These are the values that would be generated by an analog-to-digital (A/D) converter if an analog sine wave were digitized and stored in the memory.  If these binary values are fed to a digital-to-analog (D/A) converter, the output of the D/A converter will be a stepped approximation of the sine wave.  A low-pass filter (LPF) is used to remove the high- frequency content smoothing the sine wave output. 25 Linear Amplifier  Linear amplifiers provide an output signal that is an identical, enlarged replica of the input.  Their output is directly proportional to their input and they faithfully reproduce an input, but at a higher level.  Most audio amplifiers are linear.  Linear RF amplifiers are used to increase the power level of variable-amplitude RF signals such as low- level AM or SSB signals. 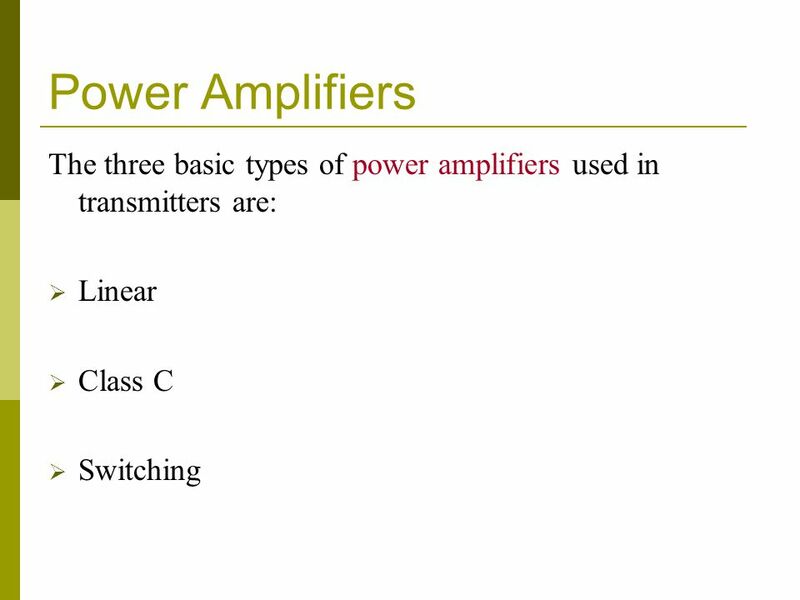 26 Amplifier Classes Linear amplifiers are class A, AB or B. 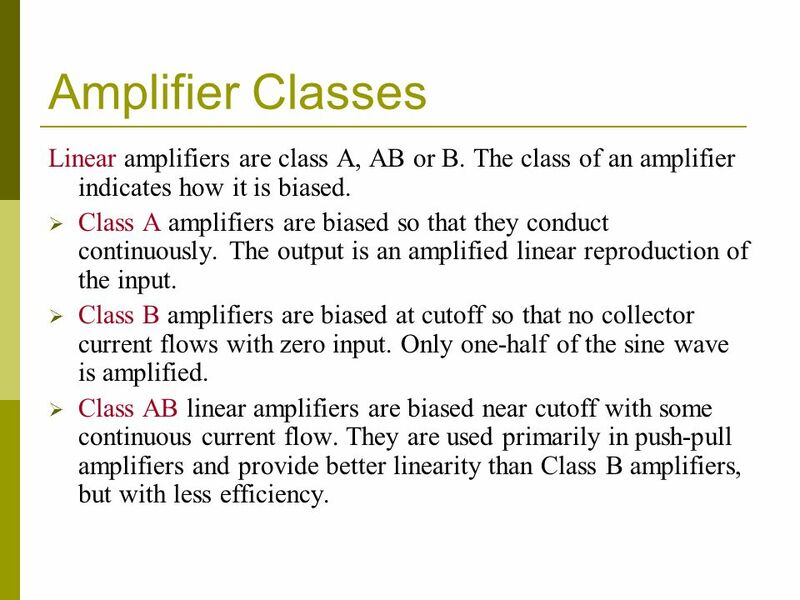 The class of an amplifier indicates how it is biased. 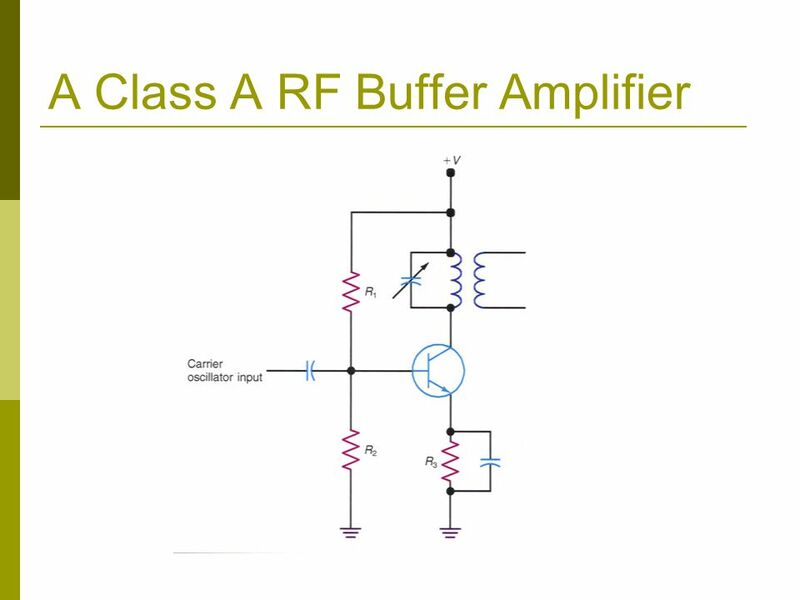  Class A amplifiers are biased so that they conduct continuously. The output is an amplified linear reproduction of the input. 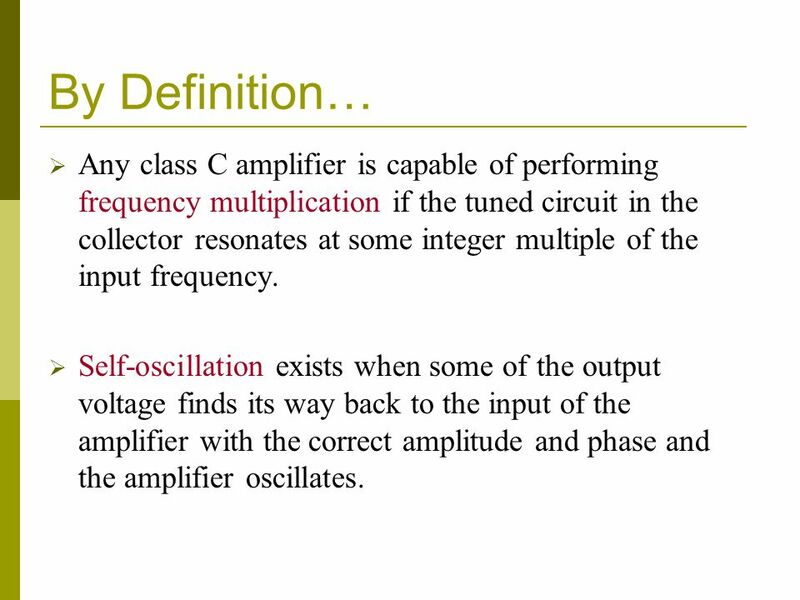  Class B amplifiers are biased at cutoff so that no collector current flows with zero input. Only one-half of the sine wave is amplified. 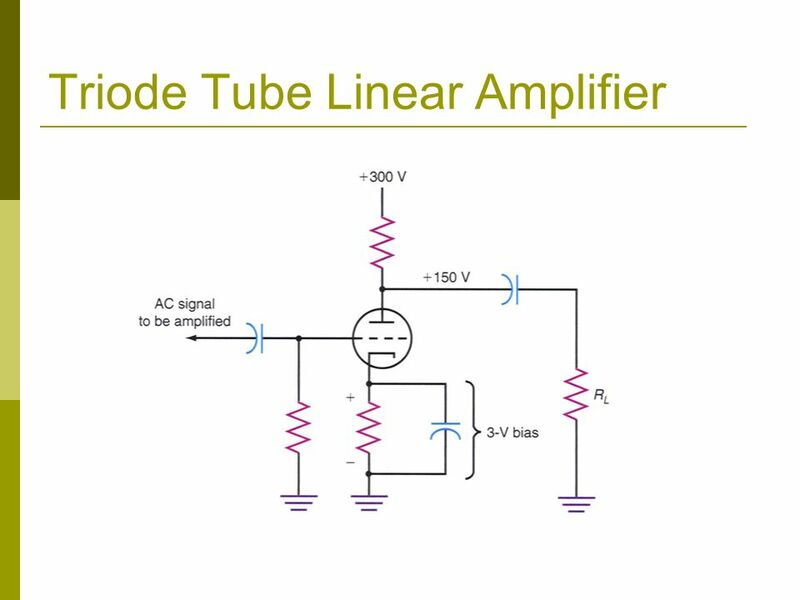  Class AB linear amplifiers are biased near cutoff with some continuous current flow. 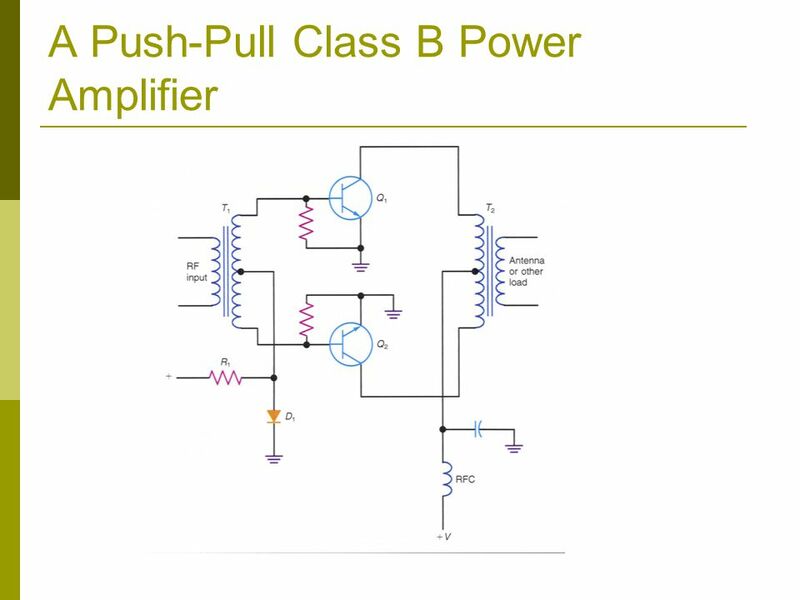 They are used primarily in push-pull amplifiers and provide better linearity than Class B amplifiers, but with less efficiency. 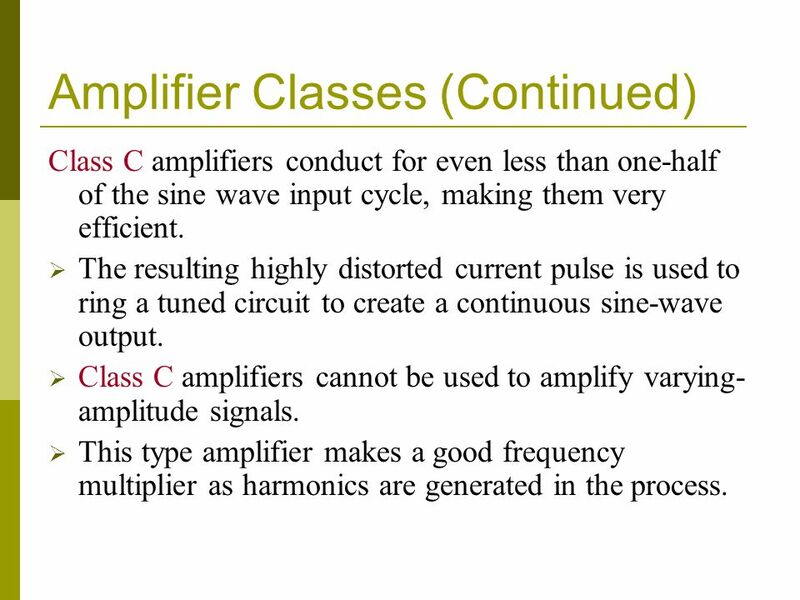 27 Amplifier Classes (Continued) Class C amplifiers conduct for even less than one-half of the sine wave input cycle, making them very efficient.  The resulting highly distorted current pulse is used to ring a tuned circuit to create a continuous sine-wave output. 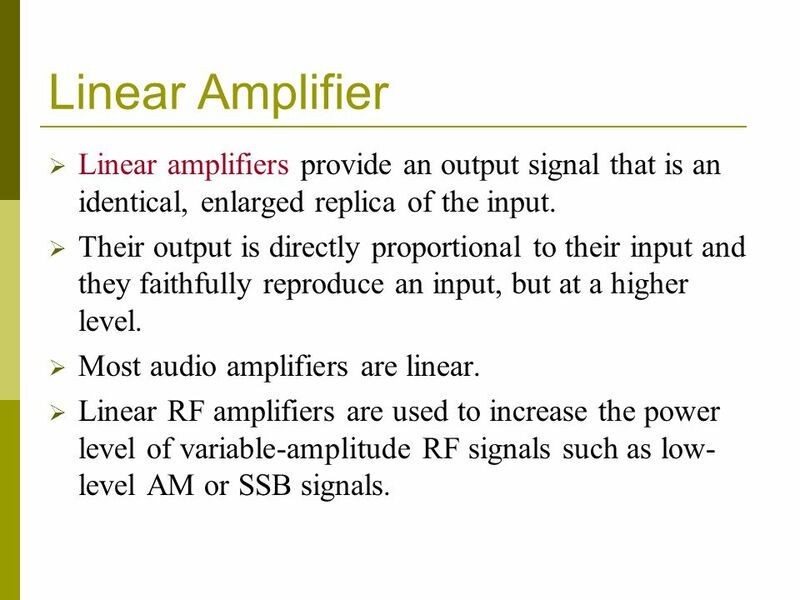  Class C amplifiers cannot be used to amplify varying- amplitude signals.  This type amplifier makes a good frequency multiplier as harmonics are generated in the process. 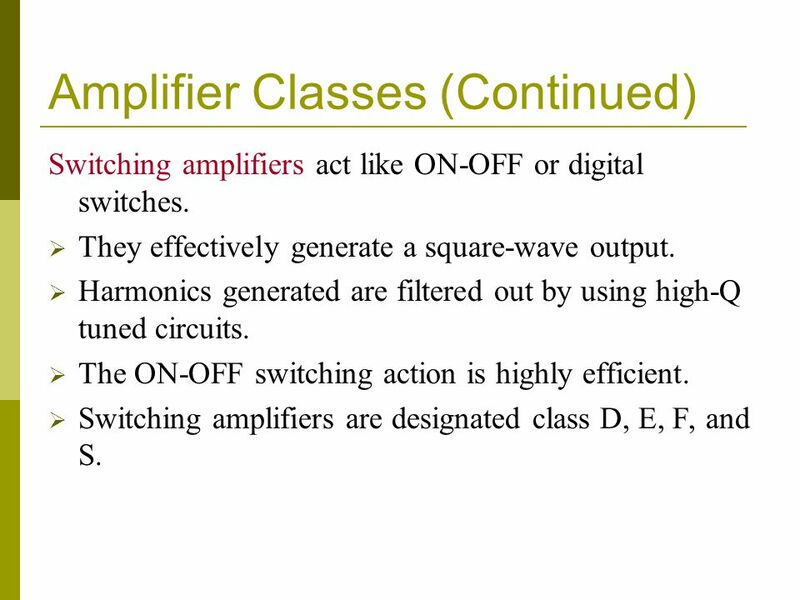 28 Amplifier Classes (Continued) Switching amplifiers act like ON-OFF or digital switches.  They effectively generate a square-wave output.  Harmonics generated are filtered out by using high-Q tuned circuits.  The ON-OFF switching action is highly efficient.  Switching amplifiers are designated class D, E, F, and S.
29 Class A Buffer Amplifier A class A buffer amplifier is used between the carrier oscillator and the final power amplifier to isolate the oscillator from the power amplifier load, which can change the oscillator frequency. 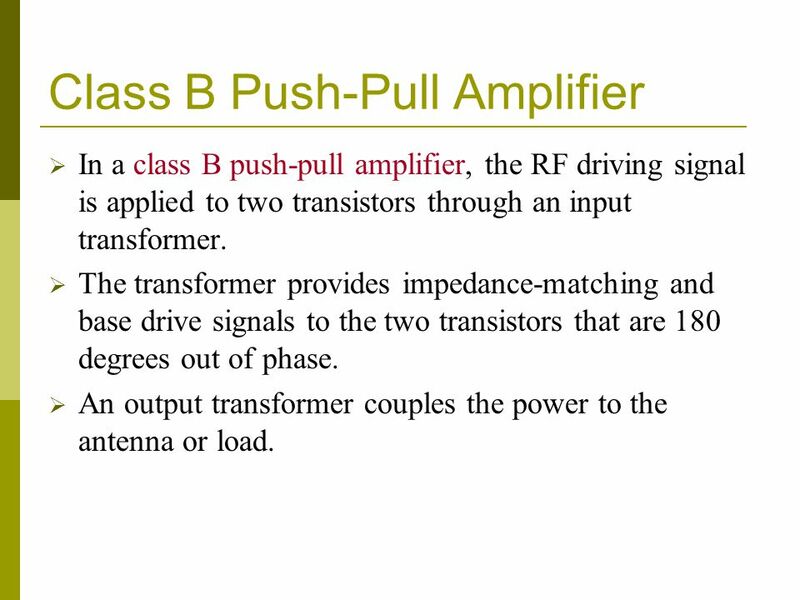 31 Class B Push-Pull Amplifier  In a class B push-pull amplifier, the RF driving signal is applied to two transistors through an input transformer.  The transformer provides impedance-matching and base drive signals to the two transistors that are 180 degrees out of phase.  An output transformer couples the power to the antenna or load. 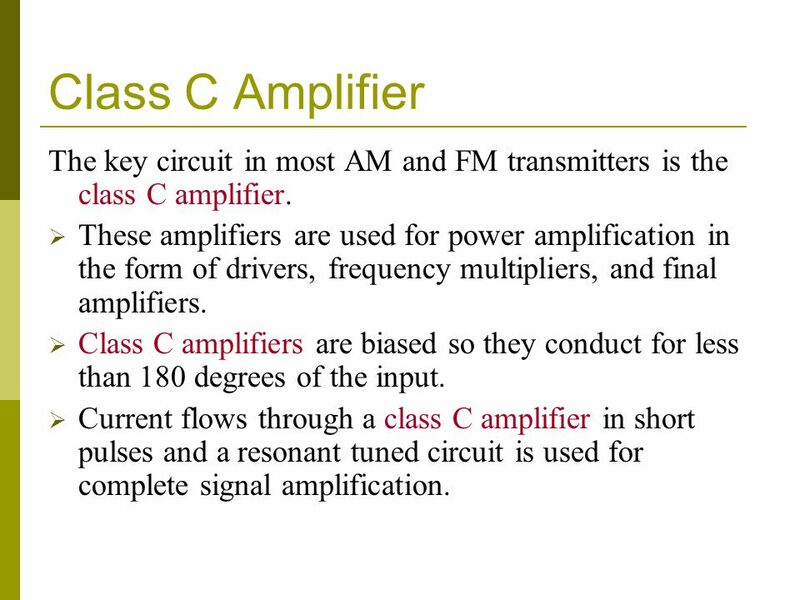 33 Class C Amplifier The key circuit in most AM and FM transmitters is the class C amplifier.  These amplifiers are used for power amplification in the form of drivers, frequency multipliers, and final amplifiers. 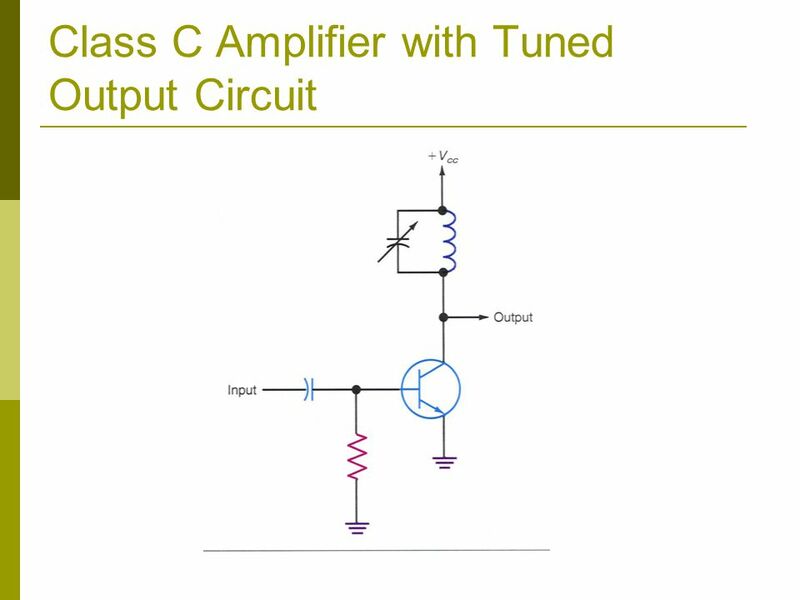  Class C amplifiers are biased so they conduct for less than 180 degrees of the input.  Current flows through a class C amplifier in short pulses and a resonant tuned circuit is used for complete signal amplification. 34 Tuned Output Circuits All class C amplifiers have some form of tuned circuit connected in the collector.  The primary purpose of a tuned circuit is to form the complete AC sine-wave output.  A parallel tuned circuit rings, or oscillates, at its resonant frequency whenever it receives a DC pulse.  The pulse charges a capacitor, which in turn, discharges into an inductor.  The exchange of energy between the inductor and the capacitor is called the flywheel effect and produces a damped sine wave at the resonant frequency. 36 By Definition…  Any class C amplifier is capable of performing frequency multiplication if the tuned circuit in the collector resonates at some integer multiple of the input frequency.  Self-oscillation exists when some of the output voltage finds its way back to the input of the amplifier with the correct amplitude and phase and the amplifier oscillates. 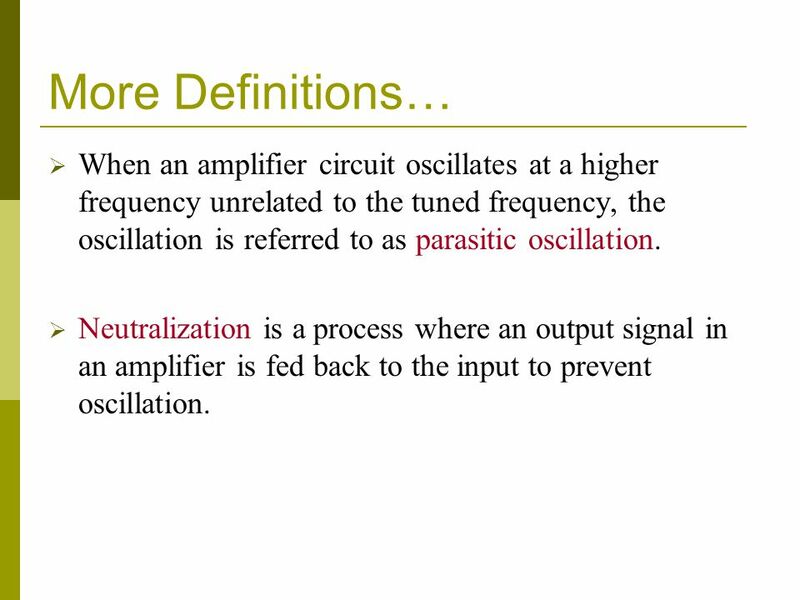 37 More Definitions…  When an amplifier circuit oscillates at a higher frequency unrelated to the tuned frequency, the oscillation is referred to as parasitic oscillation.  Neutralization is a process where an output signal in an amplifier is fed back to the input to prevent oscillation. 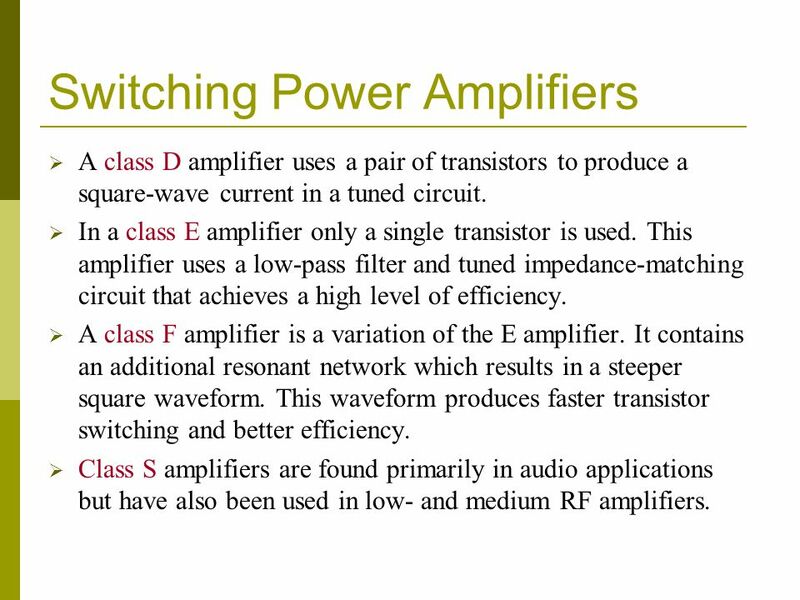 38 Switching Power Amplifiers  A class D amplifier uses a pair of transistors to produce a square-wave current in a tuned circuit. 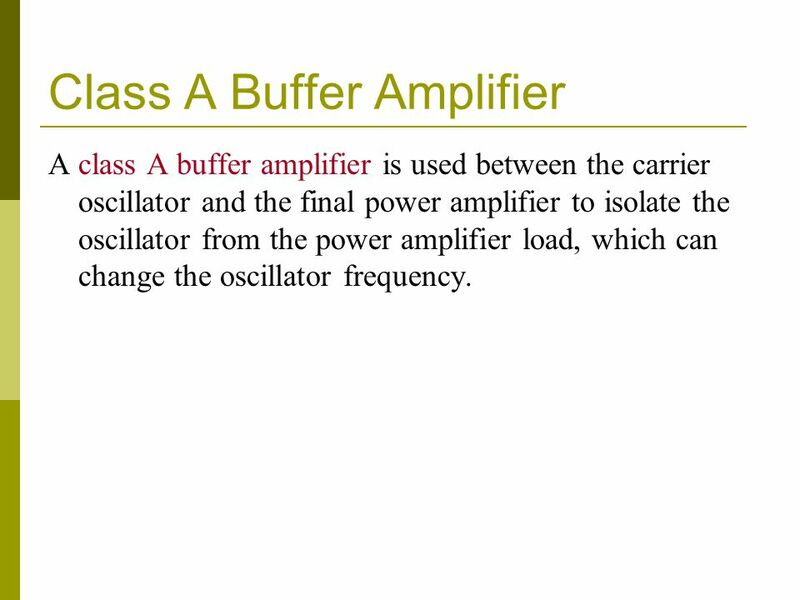  In a class E amplifier only a single transistor is used. This amplifier uses a low-pass filter and tuned impedance-matching circuit that achieves a high level of efficiency.  A class F amplifier is a variation of the E amplifier. It contains an additional resonant network which results in a steeper square waveform. This waveform produces faster transistor switching and better efficiency.  Class S amplifiers are found primarily in audio applications but have also been used in low- and medium RF amplifiers. 39 Vacuum Tubes  Vacuum tubes are still widely used in electronics, especially in communication. 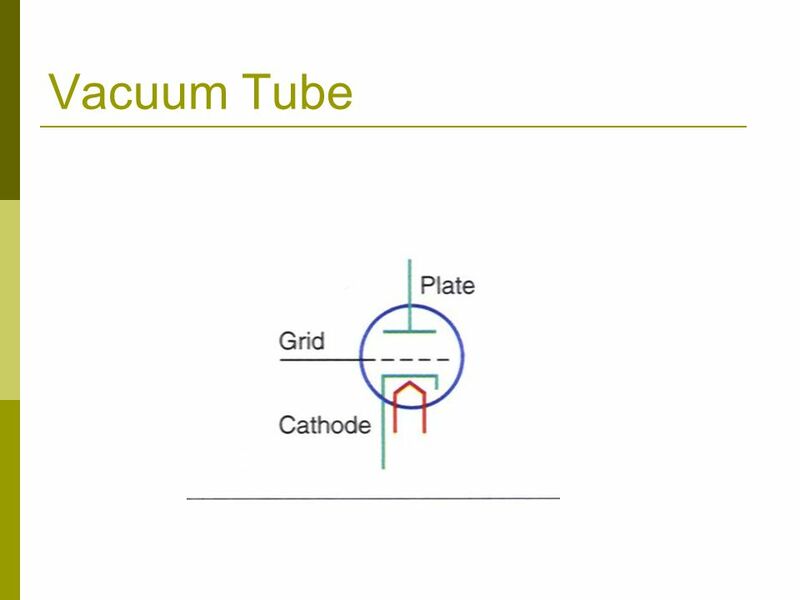  The most common vacuum tube in use today is the cathode-ray tube (CRT) which is the heart of TV sets, monitors, and other devices with visual displays. 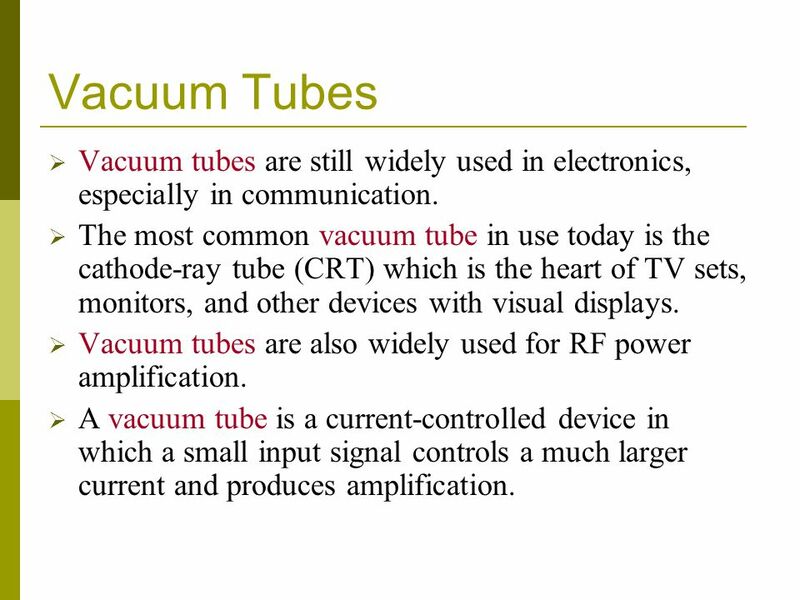  Vacuum tubes are also widely used for RF power amplification.  A vacuum tube is a current-controlled device in which a small input signal controls a much larger current and produces amplification. 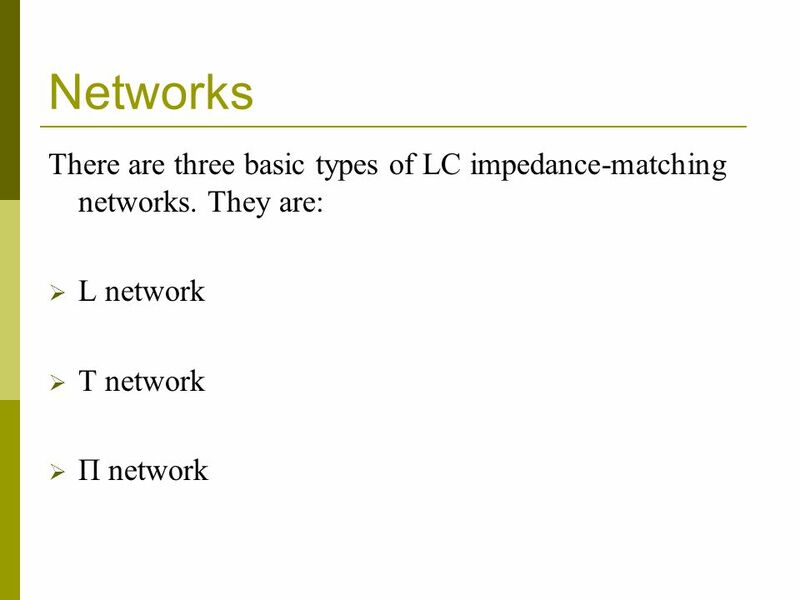 42 Impedance-Matching Networks  Matching networks that connect one stage to another are very important parts of any transmitter. 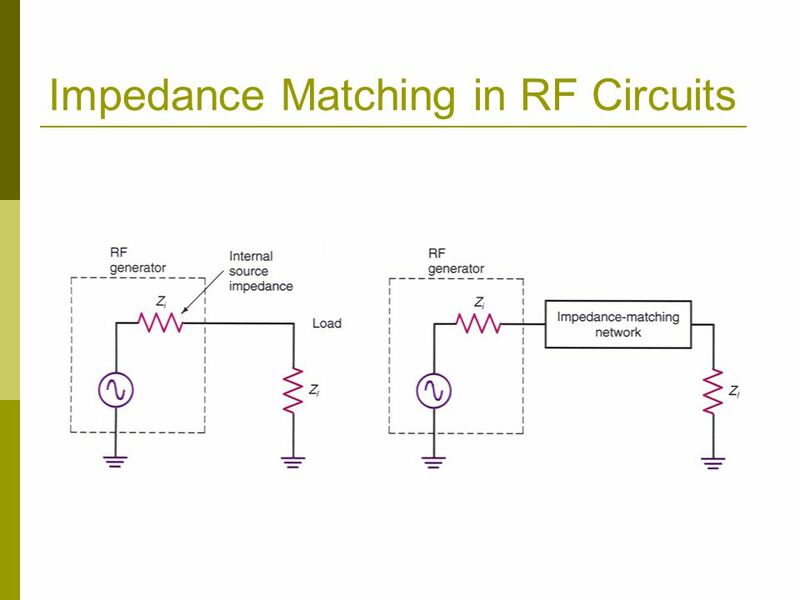  The circuits used to connect one stage to another are known as impedance-matching networks.  Typical networks are LC circuits, transformers, or some combination. 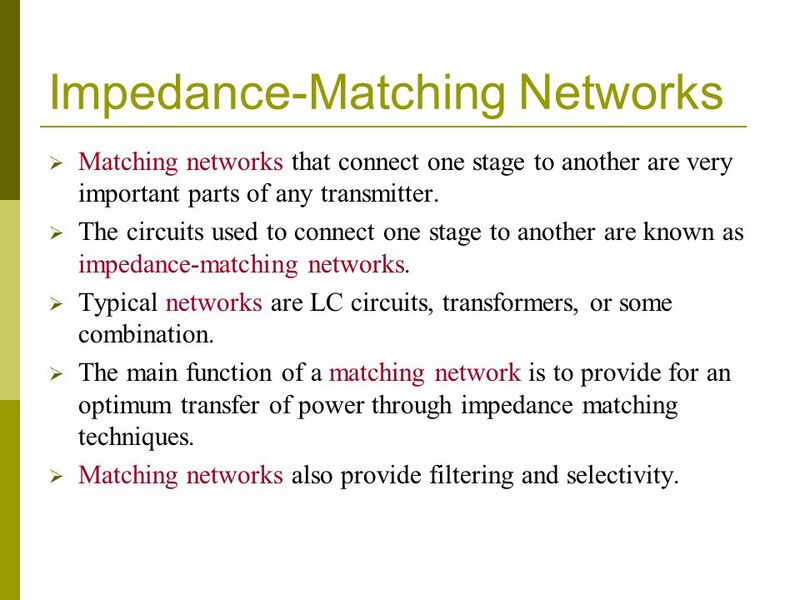  The main function of a matching network is to provide for an optimum transfer of power through impedance matching techniques.  Matching networks also provide filtering and selectivity. 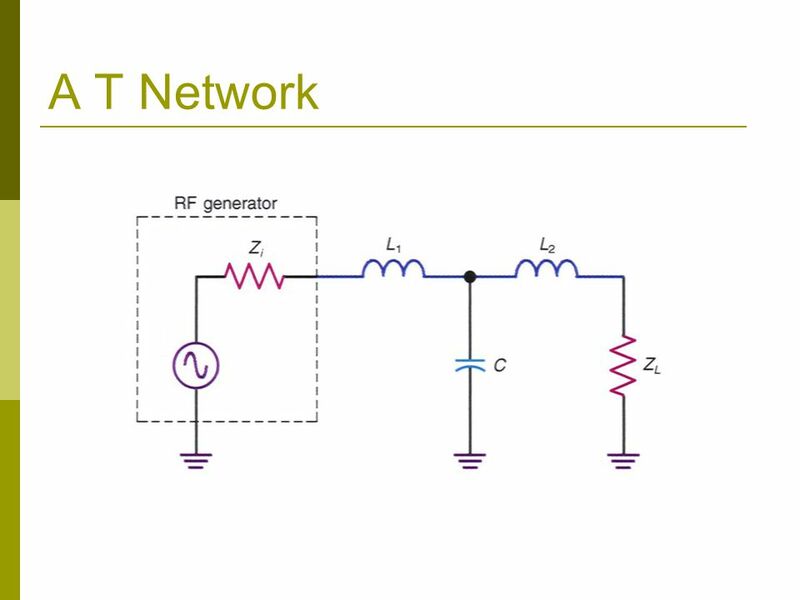 45 L Networks L networks consist of an inductor and a capacitor in various L-shaped configurations.  They are used as low- and high-pass networks. 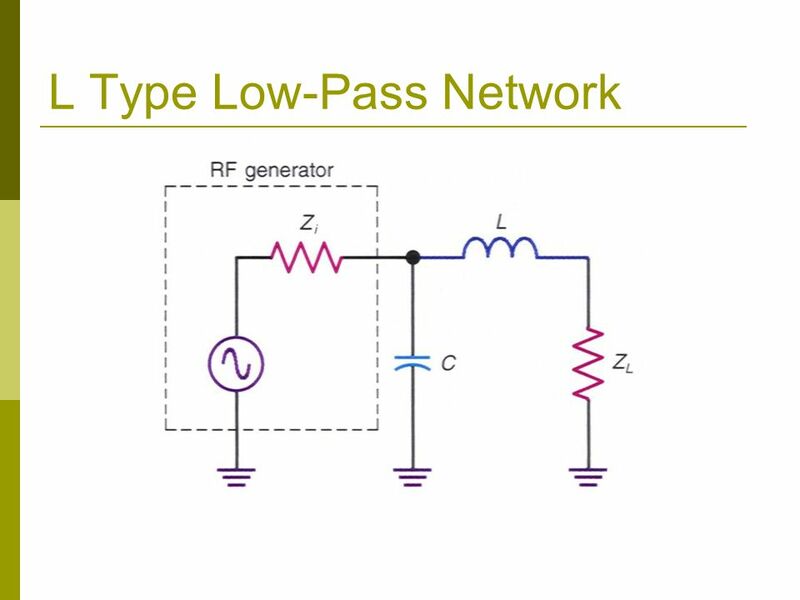  Low-pass networks are preferred because harmonic frequencies are filtered out. 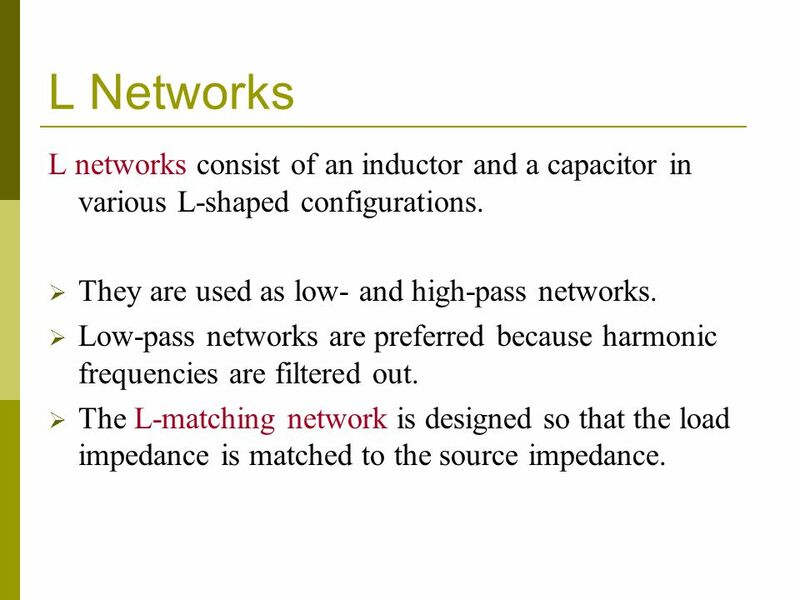  The L-matching network is designed so that the load impedance is matched to the source impedance. 47 T and π Networks To get better control of the Q, or selectivity of a circuit, matching networks using three reactive elements can be used. 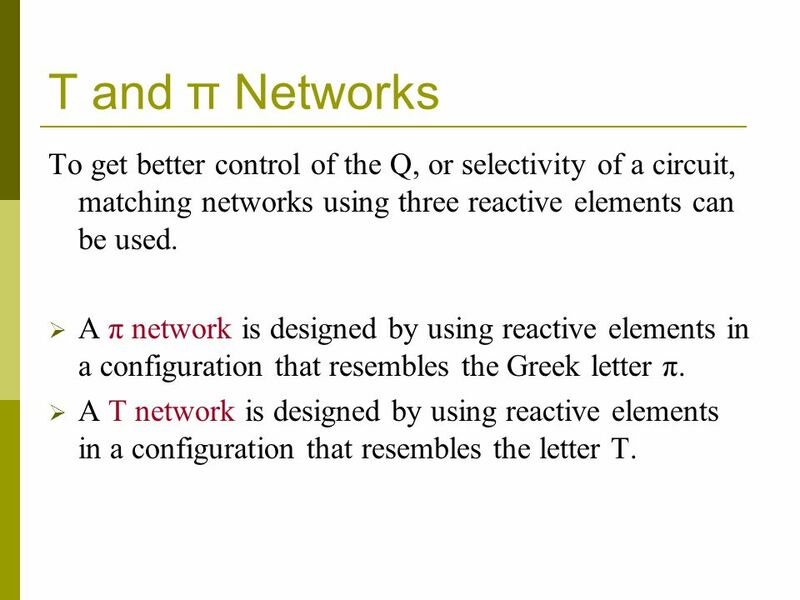  A π network is designed by using reactive elements in a configuration that resembles the Greek letter π. 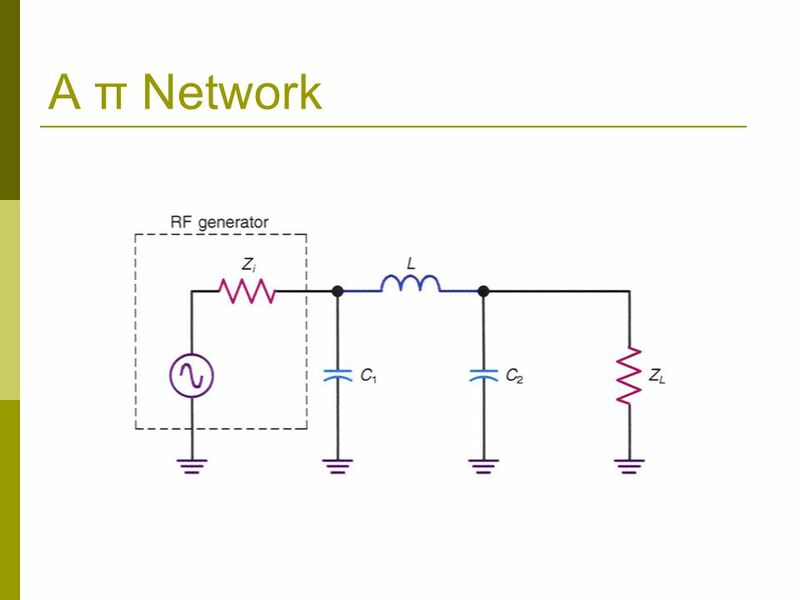  A T network is designed by using reactive elements in a configuration that resembles the letter T.
50 Transformers and Baluns One of the best impedance-matching components is the transformer.  Iron-core transformers are widely used at lower frequencies to match impedances.  Any load impedance can be made to look like the desired load impedance by selecting the correct value of transformer turns ratio. 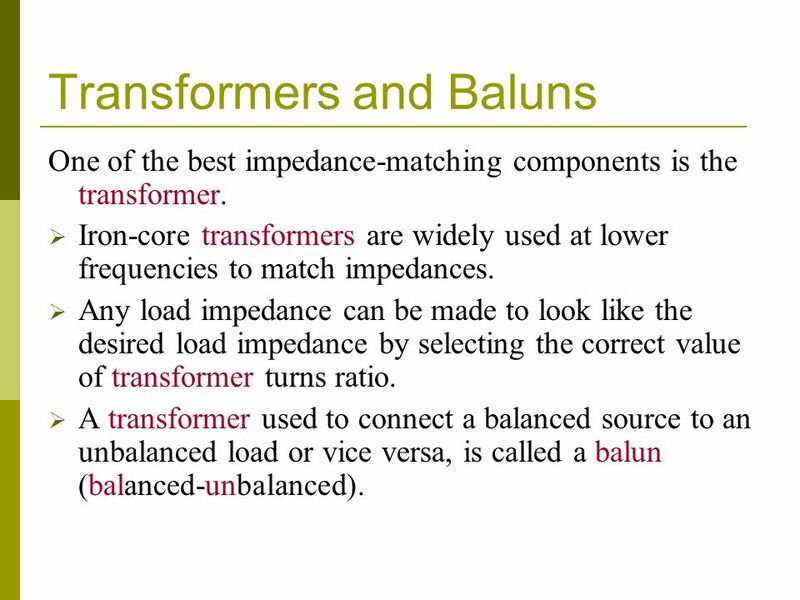  A transformer used to connect a balanced source to an unbalanced load or vice versa, is called a balun (balanced-unbalanced). 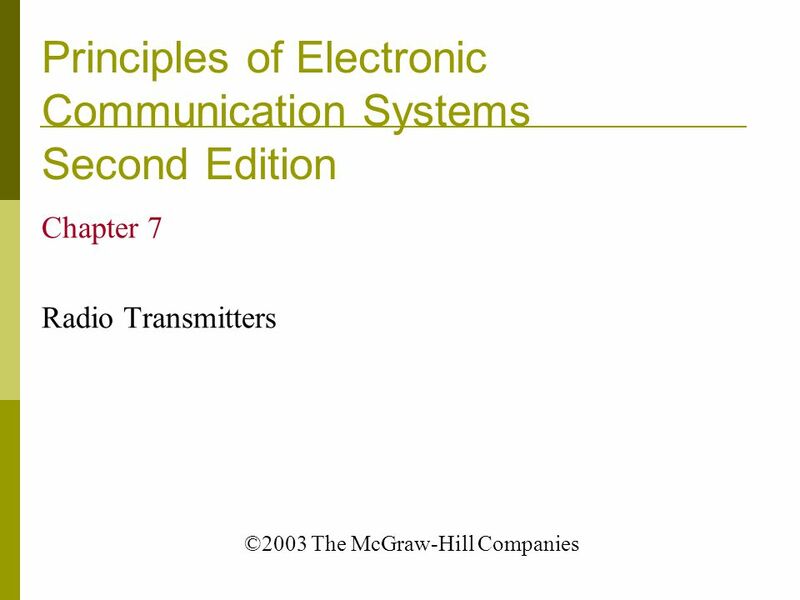 Download ppt "Principles of Electronic Communication Systems Second Edition Louis Frenzel © 2002 The McGraw-Hill Companies." 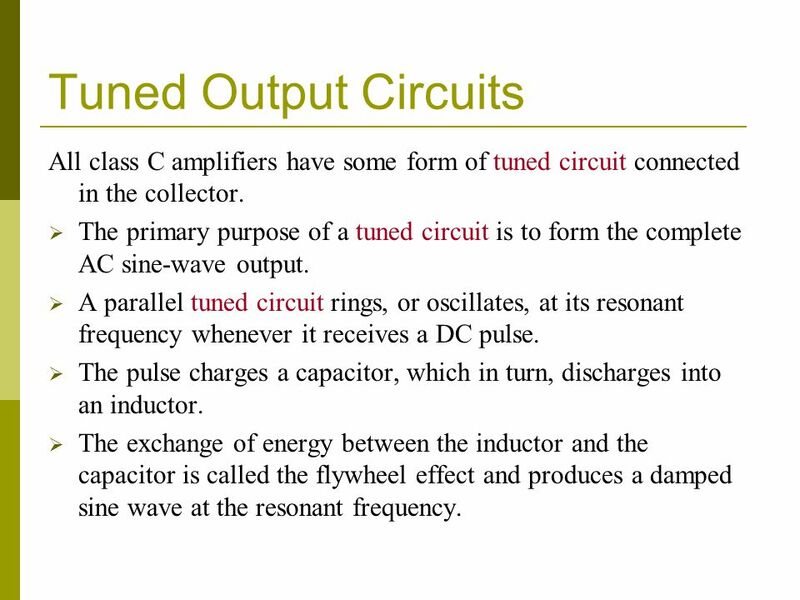 Kit Building Class Lesson 4Page 1 R and X in Series Inductors and capacitors resist the flow of AC. This property is called reactance. Resistance also. Project by Santiago Yeomans, Chad Cummins, Gboyega Adeola Guitar Signal Transmitter. Chapter Five: Transmitters. Introduction In spite of the wide variety of uses for transmitters, from toys to broadcasting transmitters, there are only.